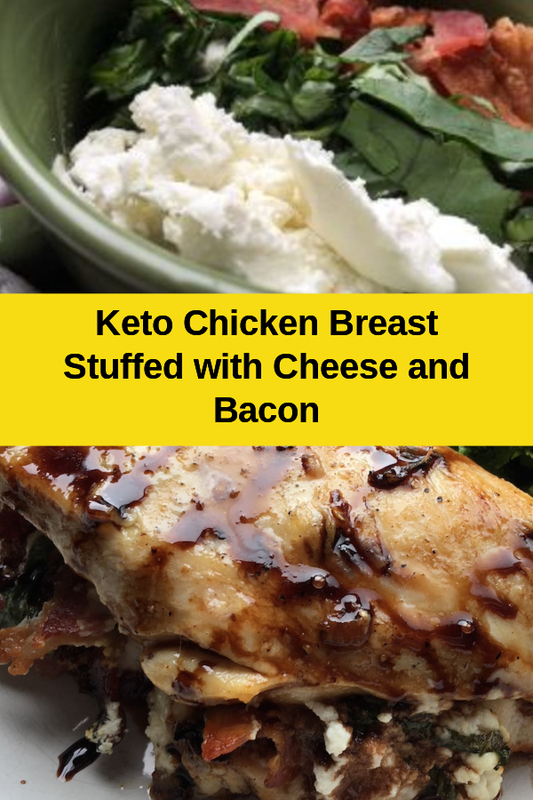 October 3, 2018 by kim 0 comments on "Bacon Stuffed Chicken Breasts – Quick Low Carb Chicken Breast Recipes"
Chicken breasts are a great standby for anyone on a low carb diet, they can, however, become a bit boring. Here are some suggestions for Chicken Breast Recipes that will prove that chicken is a great go-to ingredient for quick low carb dinner recipes. 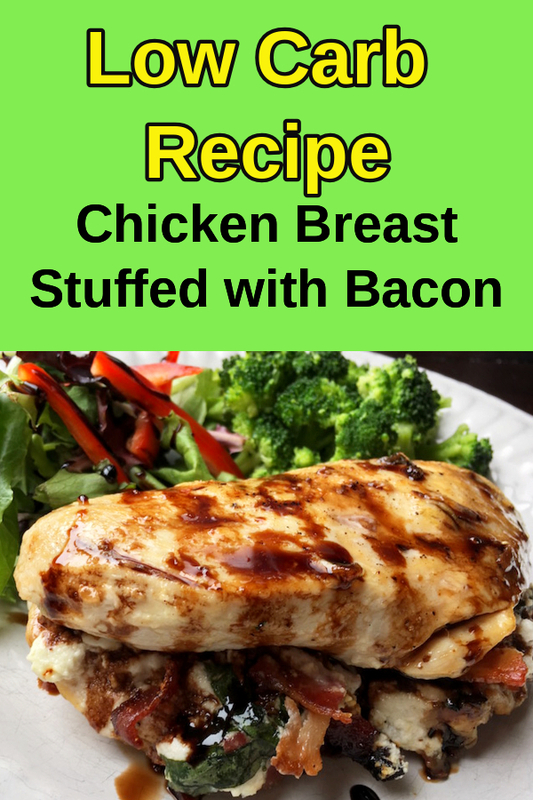 This easy Chicken Breasts Stuffed with Bacon, Goat Cheese and Basil with Balsamic Glaze recipe will be one of those quick low carb chicken breast recipes that you will turn to time and time again. I think this is very tasty as it contains a couple of my favorite ingredients; goats cheese and balsamic vinegar – yummy. Butterfly the chicken by running a sharp knife horizontally through the thickest part of each breast. Place one hand on top of the breast to stabilize while holding the knife parallel to the work surface while cutting I’ve included a video of this process below for clarity. Do not cut all the way through the breast. If the instructions are a bit confusing here is a great video that shows you exactly how to butterfly the chicken breasts. Open the breast so both halves can lie flat and season the exposed surface with salt and pepper. 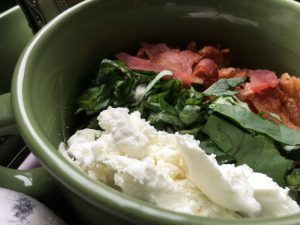 Add 1/4 of the goat cheese, crumbled bacon, and sliced basil leaves to each breast. Fold the breasts in half so the cheese mixture is surrounded by chicken breast on the bottom, back and top. I personally would secure with long wooden toothpicks, as this will ensure the stuffing mixture stay intact. Place skillet in preheated oven and cook until an instant-read thermometer reads 165 degrees when inserted into the breasts, approximately 25-30 minutes. Remove from the oven and cover until ready to serve. 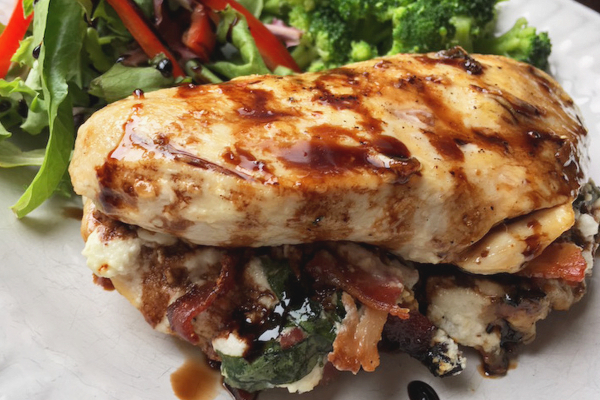 To serve, place a stuffed chicken breast on each plate and drizzle with balsamic glaze. Pairs well with a mixed green salad or roasted vegetables. Or any other keto vegetable side dish. ✅Can you Make Stuffed Chicken Breast Ahead of Time? Yep! you certainly can. Just make up the recipe as directed but leave out the basil and store in the refrigerator for up to 2 days. I leave the basil out as it tends to discolor once chopped and will deteriorate further during storage. Add fresh basil just before cooking by lifting up the chicken breasts and sprinkling it on the stuffing. They will be ready then for you to make a quick and easy low carb dinner. You can also make up the balsamic glaze in advance and store in the fridge at the same time, just reheat in a pan. 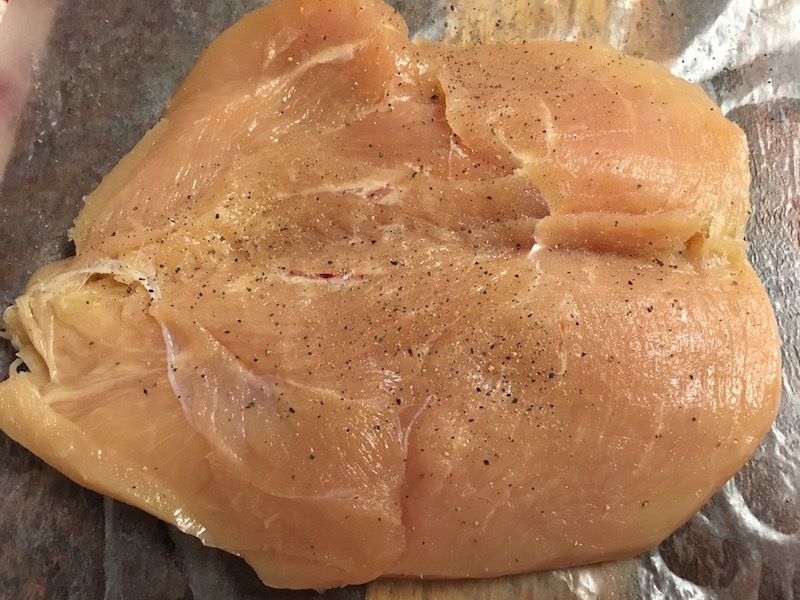 ✅Can you Freeze Stuffed Chicken Breasts? This recipe will freeze well but omit the fresh basil and this will discolor when frozen. Place the breasts in a freezer proof container cover well. Make up the balsamic glaze and freeze this separately. Defrost the chicken in the fridge and cook as described in the recipe. For the glaze, defrost and reheat in a saucepan and follow the rest of the recipe. Sprinkle over fresh basil at the end. All these recipes are keto friendly recipes, that are also gluten free, grain free and Atkins diet friendly. How about filling a chicken breast with a delicious mixture of a herb and garlic cream cheese? In this recipe by Heavenly Home Cooking the herby cream cheese is mixed with garlic, pine nuts and dijon mustard. 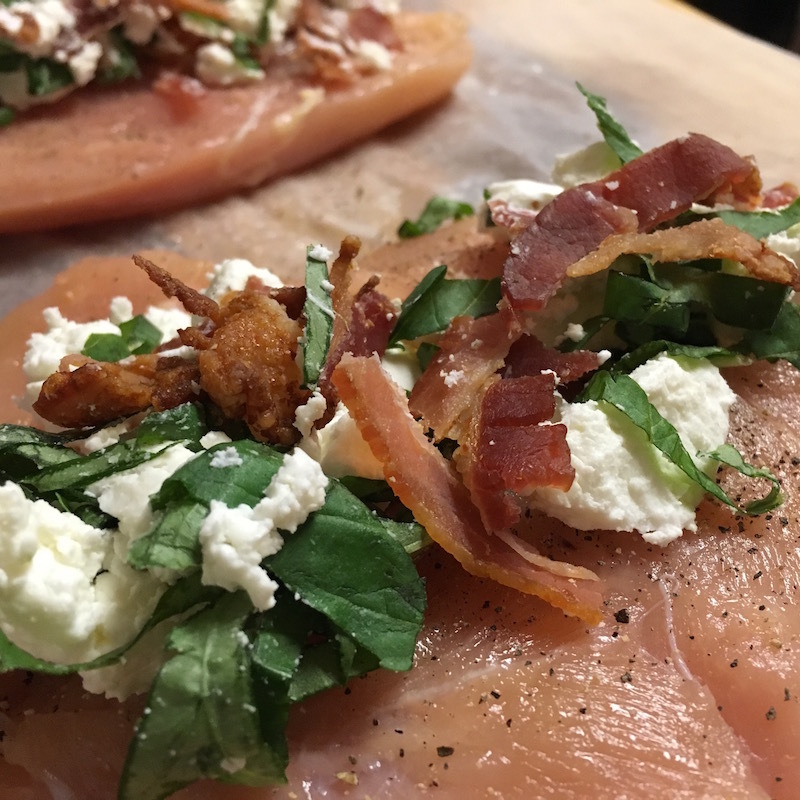 The food blogger The Lean Green Bean has a delicious goat cheese and bacon wrapped chicken breast recipe. What makes this different is that asparagus is chopped up and added to the cheese and this mixture is used as the stuffing. 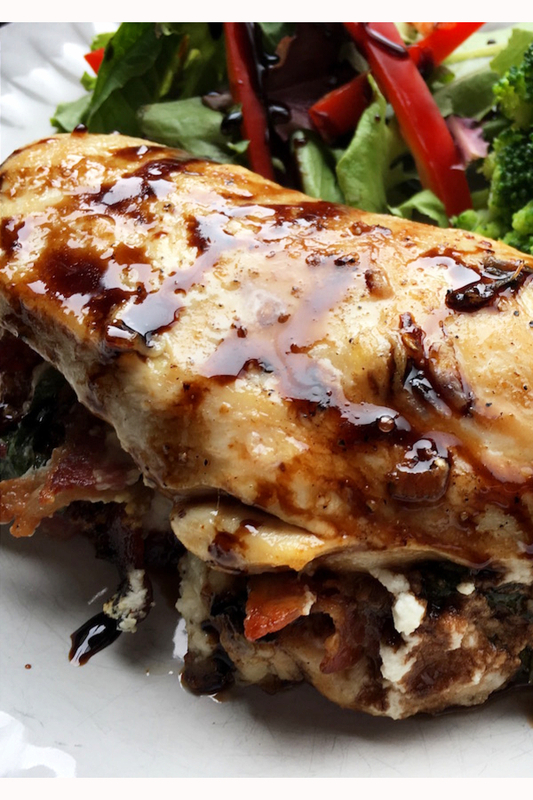 Tasty Low Carb has made a scrumptious bacon wrapped chicken recipe that is stuffed with goodies like mozzarella cheese and spinach. Serve this dish at your next dinner party and you are sure to impress any guests. 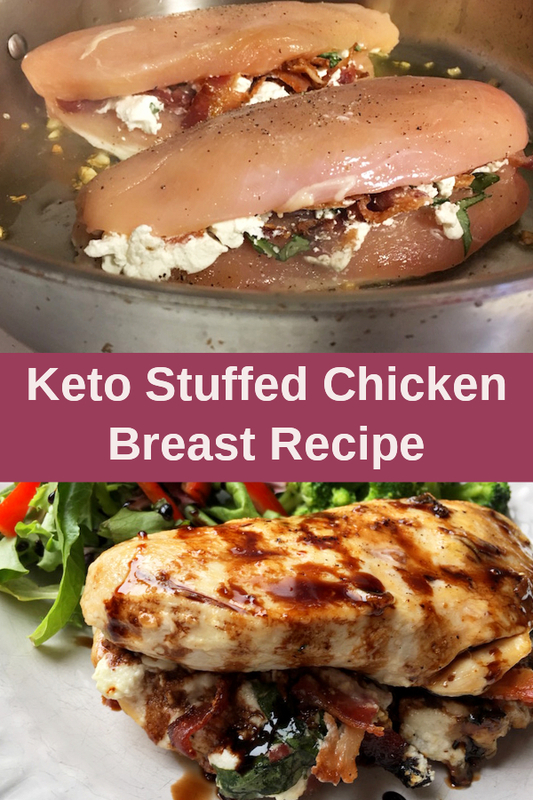 Over at Keto Summit you can find a roundup post that has 28 keto chicken breast recipes from around the internet. You can be sure to be inspired to try some of these low carb chicken recipes. 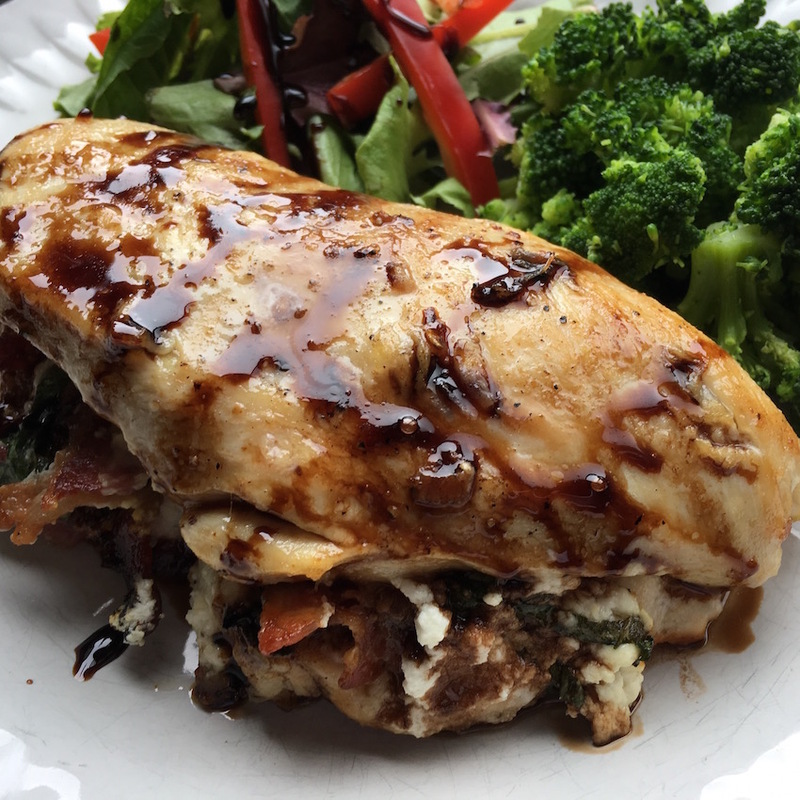 MoscatoMum has a delicious bacon wrapped stuffed chicken breast recipe. The stuffing is a delicious mixture of cream cheese and spinach. 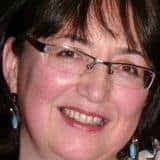 I Breathe I’m Hungry has a great round-up post that has links to 65 keto chicken breast recipes. Including Spinach and Feta Stuffed Chicken Breast and Chicken Parmesan Casserole. 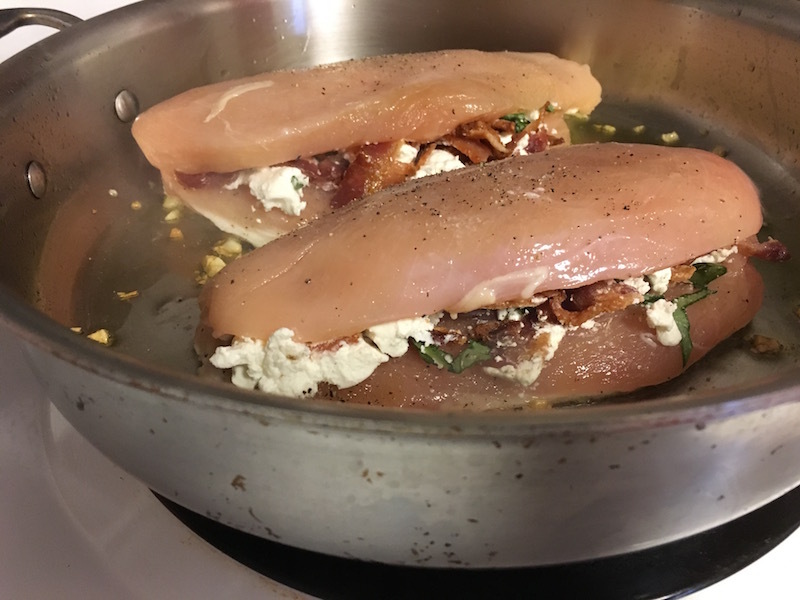 Nutritious Eats recipe for goat cheese chicken breast looks simply delicious. This is not a low carb site so I would pair this recipe with a low carb side dish like cauliflower mash and asparagus spears instead of their suggestion of potatoes. There’s plenty of bacon wrapped chicken breast recipes around but this delicious Bacon Wrapped Jalapeno Popper recipe from That Low Carb Life is a bit different. It is stuffed with a mixture of cheese together with jalapeno peppers. 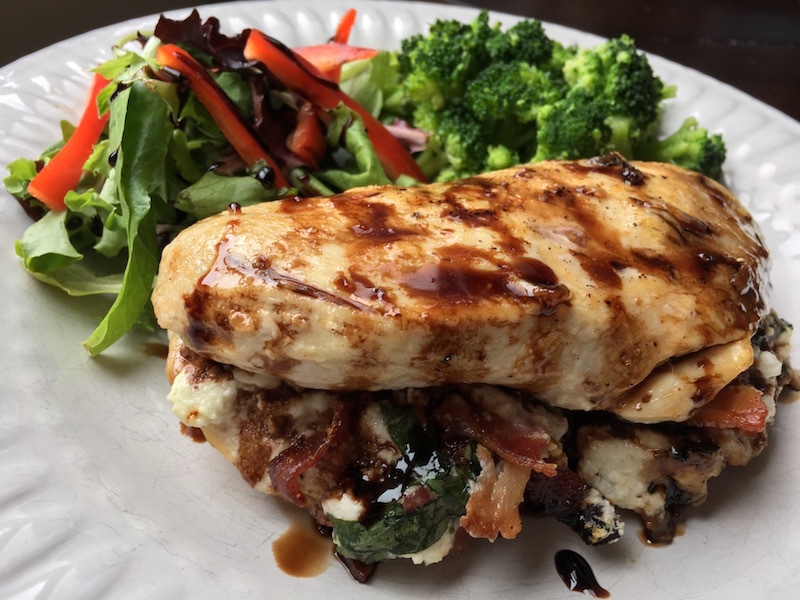 You can find a great mouthwatering cream cheese stuffed chicken breast at Tasty Low Carb that is sure to become a family dinner favorite. Stuffed with a delicious mixture of cream cheese and mozzarella. All this and only 4g of carbohydrate per portion.